Well, last week didn't go quite as expected. After battling cancer for several months, my husband's grandfather entered heaven last week. We're sad that he's gone, but so relieved that he is free from his suffering and is now celebrating eternal life with his Savior. Hopefully, this week will be a little calmer, and I can finish prepping for school and reenter the blogosphere. Tuesday was my last Library Day of the summer. That's probably a good thing, since I have six books left over from my previous Library Day that I haven't read yet. I obviously can't keep up anymore. So I tried to not go crazy and check out tons of books this time. And I more or less succeeded. . .
Fantasy was one of my favorite genres as a kid (and I didn't even discover Harry Potter until high school). There's just something special about reading fantasy books when you're a kid - they're more believable, more real. If I had to teach a class on anything, children's fantasy books would be it! 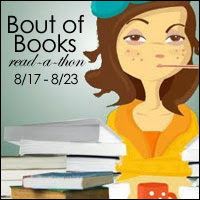 It's Bout of Books week! Regularly scheduled blog posting will resume next week. This week, my time is devoted to reading (and commenting and challenges, and all other manner of read-a-thon activities). Anyone else participating in the fun this week? Completely unplanned, I happened to read two books set in the 1990s practically back-to-back. Correct me if I'm wrong, but the 90s doesn't seem to be a very common setting. I really enjoy reading books set in the 90s because it reminds me just how far we've come in the past 20 years. Even though I lived through these changes, it's hard to see it in perspective unless we're reminded what life was like back then. My Salinger Year by Joanna Rakoff is a nonfiction memoir, although it really reads like a novel. Fresh out of grad school, Rakoff lands a job at a literary agency in New York City. But not just any agency - they have the reclusive J.D. Salinger as one of their clients! Through Rakoff's experiences, we get a look not only at how literary agencies worked at the time, but also what life was like in NYC. We run the gamut from one of the fanciest hotels to her little apartment that didn't come with a sink - or heat. Rakoff does a fabulous job of recreating the atmosphere of NYC in the 90s, as well as telling a story full of books and authors. Attachments by Rainbow Rowell is really set on the cusp of the new millennium. Lincoln works for the IT department of a newspaper. It's his job to monitor employees' computer and email usage, which means reading other people's emails. This leads to a slight addiction to reading the emails sent between Beth and Jennifer. Which leads to more than a slight crush on Beth. What exactly are the ethics in a situation like this? (It's also Lincoln's job to prepare for Y2K - remember that panic that was all for absolutely nothing?) In a book that's told half through emails, it's amazing how Rowell can make her characters leap off the page. Just like the YA novels I've read by her, I swear that Beth and Jennifer and Lincoln have to be living their lives somewhere in this world right now. Rowell leaves you guessing to the very end, but you never stop cheering for these characters who have become your friends. I reread the Chronicles of Narnia this year for about the twenty billionth time (seriously, I have completely lost track of how many times I have read this series. It's probably not that many, but close!) No matter how many times I read these books, I never get tired of them. They are still some of my all-time favorite books. This time around, I've been trying to figure out why, even after so many visits to Narnia, it never gets old. 1. Memories. An emotional connection to a book lasts a long time. The Lion, the Witch, and the Wardrobe is one of the first books I remember my mom reading to me. We laid out a blanket in the hallway, camped out, and I entered Narnia for the first time. Rereading these books means revisiting that moment. 2. Adventure. These are great adventure stories! Trekking across the country to take down an evil witch. Or sailing to the end of the world. Or putting on a ring to take you who-knows-where. The adventurer in each of us calls out to join in. 3. Humor. Despite the sometimes scary situations, there is always someone who provides comic relief. It could be a talking animal (beavers and bears come to mind), a dwarf (our DLF), or a pessimistic Marshwiggle. C.S. Lewis also has a genius for inventing names - Queen Prunaprismia, Reepicheep the mouse, Pattertwig the squirrel, Wimbleweather the giant. . . Genius! 4. Layers. The Chronicles of Narnia are books that you can read as a child and as an adult, and get two completely different things out of them. The older you get, the more you see the layers of hidden Christian meaning that Lewis included. It's found to a certain extent in all the books, but some more than others. I have to admit that The Last Battle was a book I never really got as a kid. But this time around, all the imagery of heaven just leaped out at me. I think it may end up being one of my favorite books of the series. Narnia is a place I will enjoy visiting for the rest of my life. If you haven't ever been there, I hope I've inspired you to try it out. If you have been there, leave your thoughts in the comments. What's your favorite part of Narnia? It was our (small) town's Summer Festival this past weekend, so it's been a little fun and crazy around here. There was even a rodeo Saturday evening - not a thing you would typically associate with Michigan, but it was a lot of fun to watch! Now it's time to hunker down and get that classroom of mine ready to go for the new school year.